* 7th April 2014 posted on NAFDAC website for 3 months mandatory periods to receive input(s), comment(s) and observation(s) from the Public. * 12th & 13th of August 2014 stakeholder meeting rescheduled due to the Ebola Crisis. * 2nd & 3rd December, 2014 relevant stockholders and general public met at Lagos to review the discussions. #Nigeria Food and Agricultural Import Regulations and Standards; Roles of @NafdacAgency emphasized. The National Agency for Food and Drug Administration and Control (NAFDAC) is the Government of Nigeria’s (GON) regulatory body responsible for the regulation and control of food product manufacturing, importation, exportation, advertisement, sale and distribution in Nigeria. Under the provisions of the GON Act No 19 of 1993 (as amended) and the Food and Related Products (Registration) Act No. 20 of 1999 and the accompanying Guidelines, no food item may be imported, manufactured, advertised, sold or distributed in Nigeria unless it has been registered by NAFDAC. NAFDAC was established to protect and promote public health by ensuring the wholesomeness, quality, safety and efficacy (as applicable) of food, packaged water, drugs, cosmetics, medical devises, chemicals and detergents (referred to as regulated products) consumed in Nigeria. 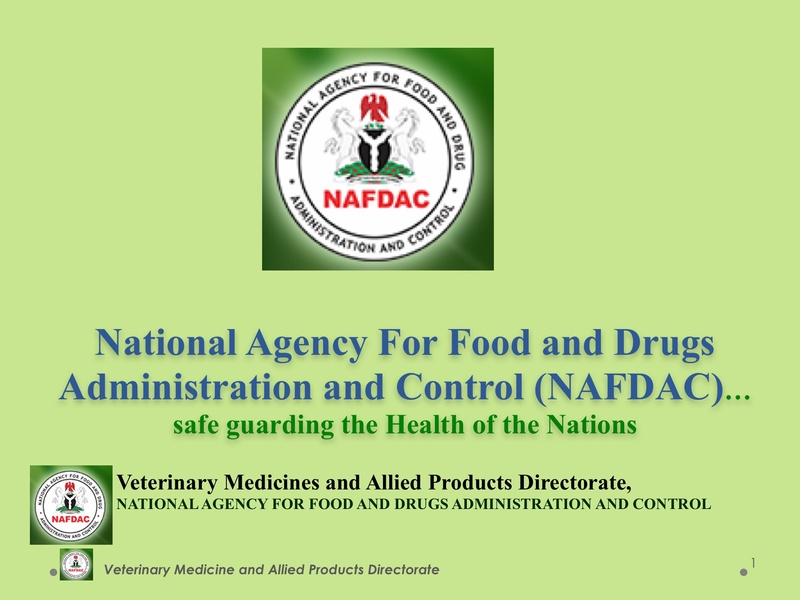 NAFDAC defines food as any “article manufactured, processed, packaged, sold or advertised for use as food or drink for human consumption, chewing gum and any other ingredient which may be mixed with food for any purpose whatsoever.” Over the past few years, the management of NAFDAC has increased surveillance to curb widespread adulteration of food products. The main strategy employed by the Agency for the enforcement of Nigeria‟s food laws is the process of product registration. Contravention of the provisions of existing food laws is subject to prosecution and punishment as specified in the code. In recent years, NAFDAC appears to have become more active and stringent in enforcing existing food laws, which has increased the level of awareness of the consumer to make informed choices and has also encouraged local producers. In theory, any food item not registered with NAFDAC is not legally importable. In practice, many processed foods are routinely illegally smuggled into Nigeria through the land boarders, by sea and by air without having gone through the registration process. Stakeholder meeting on Draft Fertilizer, Bio-fertilizer and Bio-pesticides Regulations. Perticipants cut across Academia, Private and Govermental Organizations, NGOs, Activist. The Draft Regulations would be posted to the NAFDAC site http://www.nafdac.gov.ng and the VMAP blog (vmapblog.wordpress.com) for comments, contributions and Observations. The Public Public is hereby requested to do so as the Draft would remain on the site for a period of three(3) months. Thank you. 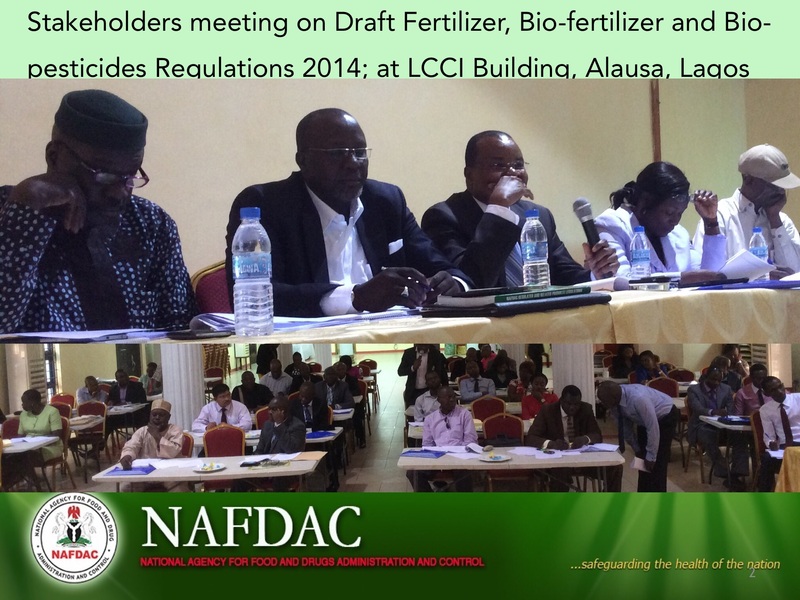 Stakeholder meeting on Draft Fertilizer, Bio-fertilizer and Bio-pesticides Regulations. #Nigeria: VMAP was created in #NAFDAC to ensure effective #OneHealth approach. Aflatoxins: serious threat to food safety and food security, but is it related to livestock? Aflatoxins are cancer-causing mycotoxins produced by the mould Aspergillus flavus. Aspergillus can grow in a wide range of foods and feed and thrives under favourable conditions of high temperature and moisture content. Aflatoxin contamination can occur before crops are harvested when temperatures are high, during harvest if wet conditions occur and after harvest if there is insect damage to the stored crop or if moisture levels are high during storage and transportation. Aflatoxins in contaminated animal feed not only result in reduced animal productivity, but can also end up in milk, meat and eggs, thus presenting a health risk to humans. The poster below, prepared for the Tropentag 2014 conference, presents an overview of a research project led by the International Livestock Research Institute (ILRI) aimed at measuring and mitigating the risk of aflatoxins in the feed-dairy chain in Kenya.